The Russian Ministry of Economic Development looks to accelerate economic growth to 3–3.3 percent in 2014–2016 by investing oil revenues into infrastructure, easing monetary policy and encouraging private investment. Investments will become the main driving force of the economy in 2014–2016 as Russia does not possess any other means to accelerate growth, the Ministry of Economic Development says in its updated macroeconomic forecast. Improving the business climate and reducing external risks would lead to a reduction of capital outflow and to a resumption of capital inflow from 2016. Businesses, having positively assessed growth in domestic and external demand, will need more finance, and the Central Bank will start to cut its interest rates, which in turn will accelerate growth in lending to companies. Credit funds will be used to invest in improving the competitiveness of products and in import substitution. 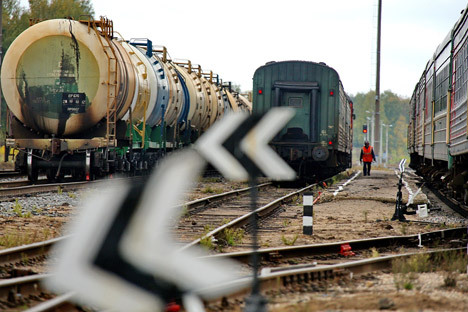 The government should support the acceleration of investment by investing in key infrastructure projects (the high-speed highway from Moscow to Kazan, development of the Baikal-Amur Mainline and Trans-Siberian Railway and the Central Ring Road project in Moscow Region). The ministry admits that a risk to the baseline scenario is the assumption that investment growth will increase to 3.9–6 percent (it fell by 1.3 percent in the period January–August 2013). The forecast for the year is 2.5 percent. However, investment can in any case stimulate economic growth, at least over the next year – due to technical reasons. The drop in investments this year is also mostly down to technical reasons, explains the ministry. Gazprom, which accounts for about 10 percent of all capital investment in the Russian economy, has completed the construction of the Nord Stream pipeline, cutting its investment programme by nearly one third. The government has also completed a number of construction megaprojects, and government investment has decreased by 20 percent in real terms. Over the next year, there will be no such decline, and the “base effect” which had a negative impact on economic growth this year will, on the contrary, enhance growth. This effect in the second half of 2013 is predicted to improve growth in GDP to 2.2 percent compared to 1.4 percent in the first half. However, growth in private investment (excluding state-owned companies), on the contrary, is forecast to slow down — from 11 percent this year to 5 percent in 2014. The ministry, hence, expects a rather large contribution from quasi-budget projects — construction of roads using money from the National Welfare Fund (NWF). “Infrastructure is an opportunity to increase potential growth, and the government should therefore actively participate in this,” Oleg Zasov, director of a department of the ministry, said. However, budget rules impose restrictions, and therefore oil and gas income is the only source of funding available. An easing of the Central Bank's monetary policy is expected to maintain the high rates of growth in consumer lending — at least 20 percent per year, offsetting the slowdown of the growth in real incomes: as recently as a month ago, it was assumed that the latter in 2014–2016 would be higher or at the level of 2013. This growth will be slowed down not so much because of the decision to index tariffs for the population in 2014 (their addition to the inflation rate will only be about 0.2 percentage points) but more because of the pension reform that starts in 2015. The reform stipulated increased payments for pensionable service of over 30 years for women and 35 years for men, but the authorities decided not to implement this measure. According to the Pension Fund, more than 20 million — about a half — of today's pensioners come under this category. Downward revision of the average pension for 2015 has led to a reduced rate of growth in real incomes of about 10 percent — the predicted growth has been downgraded from 3.3 to 3 percent. The average annual nominal growth of pensions for 2014–2016 will be lower by a quarter: 7.5 percent instead of 10 percent. An increasingly large share in the structure of consumption will be given to domestic goods, the Ministry of Economic Development predicts. The causes of Russia's slowdown are not cyclical but rather structural, and growth in GDP is unlikely to be higher than 2 percent over the next 5–10 years, says Ivan Chakarov of Renaissance Capital. There are two options to improve this rate. The state, as signals from the government appears to show, has not embraced the first option — structural reforms, says Chakarov. Privatization has been put off and pension reform is being delayed. The second option — to increase external borrowing — is the only option available. Growth of external debt from its current 3 percent to 3.5 percent of GDP (which is only half of the level of India or Brazil, says Chakarov), according to calculations by Renaissance Capital, will attract approximately 1.2 trillion roubles in investment to the economy. “In the absence of reform, this is the only possible scenario for the government that would have a positive effect on the economy,” said Chakarov at a Fitch conference. Money will be needed in any case — with both the State Duma election and the new presidential election approaching, he says.